High levels of opioids being prescribed lead to an unexpected rate of addiction. One of the first objectives the coalition worked on was to reduce the amount of overprescribing in the region. At the time the coalition was founded, the region’s rate of opioid prescriptions was double the average in California. 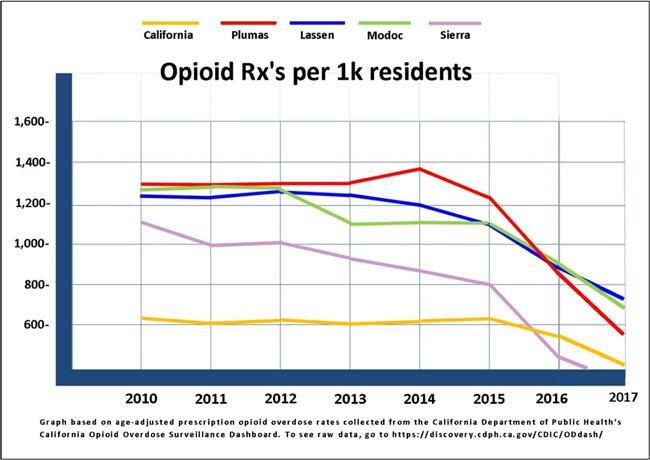 Representatives from the Modoc Medical Center, Banner Lassen, Seneca HealthCare, Plumas District Hospital, and Eastern Plumas Health Care formed the Safe Prescribing Action Team and worked on figuring out what was a "normal" amount of opioids to prescribe for pain. In the midst of the action team developing its own set of prescribing guidelines, the CDC released recommendations on prescribing opioids. The action team utilized these recommendations and adopted a universal set of guidelines around the region. The result was a nearly immediate decline in overprescribing.